An introductory workshop to releasing your inner abstract artist. This 2 day workshop held by International Abstract Expressionist Jilli Nel is aimed at helping you to loosen up your work…and designed to teach an introductory into the techniques and processes behind Abstraction. 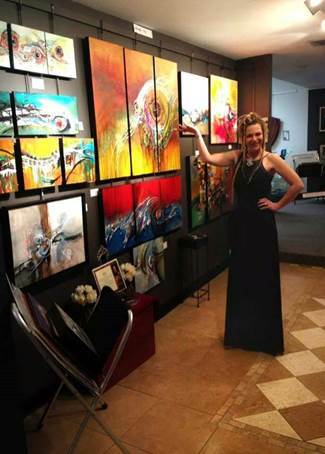 Jilli has been is USA for 3 years and has made an impact on the art world with her vibrant abstract paintings that are filled with Life and flow with energy , very much like herself. Allow her to show you how to Let Go and Let Flow. Be sure to bring your inner child along with you to this one. Acrylic paints … your own choice. As many different colors as you want. We will be painting flat on top of tables so no need for easels .. unless you prefer that. Most important…. Do not forget to bring along your inner child… Your enthusiasm and your sense of humor …. !